Now you can earn money for Camp Promise-West just by shopping at Fred Meyer and using your Rewards card! All you need to do is follow the steps below to link your card to Camp Promise-West. Plus, you'll still get to earn your Rewards Points, Fuel Points, and rebates. step 1: Login to your Fred Meyer Rewards Account. 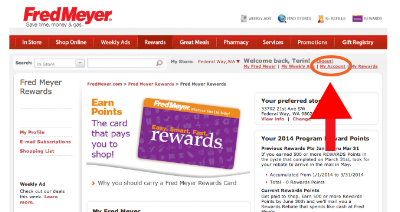 If you do not already have a Fred Meyer Rewards account, please create one, then login. Step 2: Click the My Account button. My Account is located in the upper right corner. Find the Community Rewards Box on the bottom right side of the screen and click the Edit button. When prompted, type in "Camp Promise" and click "Search." Camp Promise-West should appear after you search. To confirm, our organization number is 83123. Select Camp Promise-West and click Save. That's it! You'll continue earning rewards and so will we! Share this page with all your friends so we can raise even more awareness and support for camp!